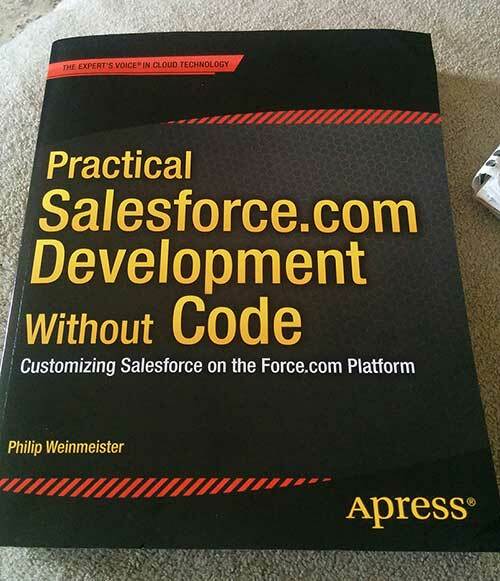 Practical Salesforce.com Development Without Code written by Phil Weinmeister has been recently released. I think the book really targets those new to the Salesforce platform and does a wonderful job of providing examples and providing a reference that will be useful in the future. Phil Weinmeister has done a phenomenal job putting together some different scenarios where it makes absolute sense to make use of the declarative functionality that Salesforce provides. As a developer I’ve struggled quite a bit when to use “clicks not code” and feel that Phil has great examples that would be useful to most Salesforce Admins and developers to learn from. Some of the topics covered include workflows, approvals, process builder, validation rules, and more. The chapter on object and field level permissions in Salesforce is really well written. I really wish this book had existed when I was first starting to use Salesforce. Overall, I recommend using the book to learn the declarative features of Salesforce. Computers have interested me virtually my entire life. I don’t remember when I got my 1st computer, I remember my dad and mom taking about how my dad would play computer games or use a bbs and have me sitting in his lap. Around the time I was six my dad was given a computer by one of his friends that apparently wasn’t working, I remember it briefly it was a 286 and the case was a very rugged metal, but what I remember most was that my dad got the computer going again and eventually put it in my bedroom. There were many days and nights I read out of an old beat up DOS manual. Eventually, my dad got a 486 and I inherited his old 386 that could run Windows 95 and HotDog! I made my first website with HotDog and eventually decided to move onto Homesite 1.0 which was extremely awesome and allowed me to learn HTML 3. I started doing chores and using birthday money to buy books, and better computer equipment. I continued on and eventually went to Niagara College for Computer Engineering, but eventually switched to Computer Programming because that’s where my passion truly exists. What first attracted you to this field? The constantly changing and evolving web and computers has always piqued my interest. I’m lazy, I don’t like repetitive work, I couldn’t imagine working in a factory on an assembly line or working somewhere where I don’t get to learn every day. I love learning, experimenting and figuring out how to accomplish a goal as long as I’m still able to tinker I’m sure I’ll develop. It’s no secret that I work as a freelance software/web developer and often jump around between languages. I, continually, run into projects where the developers are ignoring warnings produced by the compiler which can lead to some very sloppy code along with some very interesting situations that occur as the code runs in production. In my experience, warnings are almost always a bug in waiting especially warnings for assignment operators used in an if statement instead of the equality operator (very common in C variants.) Spend those extra few hours when you develop and try to ensure that you keep the compiler warnings to a minimum, so your code is clean and doesn’t appear to be sloppy. Warnings also destroy your credibility as a developer, because they make your code look sloppy and suspect whenever a problem occurs. If you’re an employer, do your developers compile with warnings on and if they compile with warnings on do they take the time to resolve them? Error messages should be clear and include what the error is, why it was caused and how to resolve it. I have been trolling Craigslist and Kijiji lately in hopes of finding some additional freelance work to add to my portfolio before I become a full time freelancer/consultant. Read the advertisements has proven to be a terribly frustrating experience. Advertisers need to always remember that the more details they provide will lead to a much more realistic budget and a system that better meets their needs. Advertisements need to be as detailed and as short as possible. If the programmer is expected to modify or write plugins for an existing application or website you need to provide details on how the previous system is implemented. Ideally, you will answer all of the following questions. What programming language? What database is it using? Who is hosting it? Is there any sort of documentation? Do you have programming guidelines? Regarding the actual project or changes to an existing project require you to answer additional questions. Is it completely new project? Who will own the work (source code, graphics, etc)? What’s the timeline? What should the application do? What is the scope of the project? Always remember that you also get what you pay for and that if you pay minimum wage or outsource to another country (China,India, Brazil, etc) you will likely get inflexible crap that will have to be redone if your site or application goes through some sort of expansion. To check if Skype is installed, in regedit check if the following key exists: HKCUSoftwareSkypePhone, SkypePath . This key points to the location of the skype.exe file. If this key does not exist, check if the HKLMSoftwareSkypePhone, SkypePath key exists. If the HKCU key does not exist but the HKLM key is present, Skype has been installed from an administrator account but not been used from the current account. Generally, I only care if the Current User has configured Skype, so I will ignore the HKEY_LOCAL_Machine information and instead rely entirely on the HKEY_CURRENT_USER information. You must make sure you reference: Microsoft.Win32 for the registry functions or modify the snippet slightly. Have you ever wanted to have the ability for the colour of a row to change when your user moves the mouse over top of a particular row, and then change the colour back whenever the cursor is moved back off? We need to override the Render class and then add some attributes to each GridViewRow before the page is finally output to the browser. In this example, I have called the gridview we are adding the mouseovers and mouseouts “gvClients” because it displays a list of my fictional company’s clients. Wherever you see gvClients you need to make sure that you change this to your respective gridview’s name. //We finally just pass in the html that’s now been created.